MeanWell UHP-200A-5 LED panel switching power supply is enclosed type, low-profile, and universal AC input power supplies with high efficiency. The 26mm low-profile and 55mm slim width design can easily reduce the cabinet design and simplifies the installation. These power supplies feature built-in active Power Factor Correction (PFC) function and a fan less design suitable for indoor usage. The UHP-200A series adopt new circuit design topology to enhance whole system performance by achieving high conversion efficiency and to save energy. 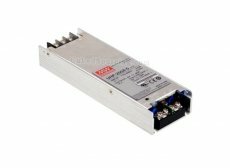 These power supplies offer low leakage current and provide protection against short circuit, overload, over voltage, and over temperature. The UHP-200A power supplies are available in 4.2V, 4.5V, and 5V output voltage options. Suitable applications include indoor/outdoor LED electronic signage, LED channel letter, LED moving signs, and LED TV walls. Please contact us if you want UHP-200A-4.2 or UHP-200A-4.5. • Power on LED indicator.